Aero (or “Aero glass,” as some geeks called it) is more than just lipstick on a pork rind. 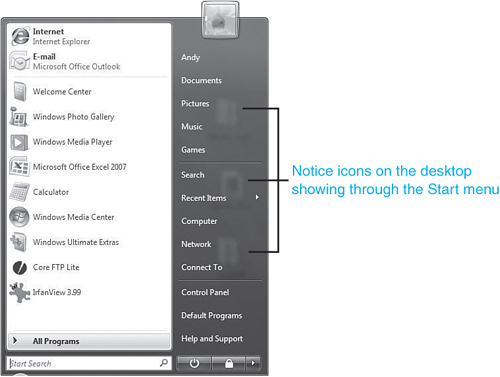 It offers a series of enhancements that make Vista both fun and easy to use (see Figure 1). Figure 1. Oh look! The windows are see-through in Vista’s Aero interface. Windows and the Start menu have glasslike edges. Icons are no longer static. Now they are thumbnails of the files they contain. When you minimize a window to the taskbar, you can preview what’s in it by rolling your mouse over it. As you do, a window with live content (including video that plays) appears in the preview. The new Flip 3D interface (activated by holding down the Windows key + Tab) allows you to flip through open windows in 3D (see Figure 2). Figure 2. 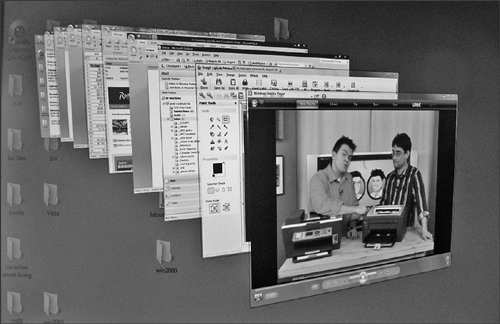 The Flip 3D interface is a fun way of browsing through open windows. Windows that allow you to explore files and folders (traditionally called Windows Explorer) are redesigned to better find content. Search bars perch at the top corner of all system windows. And the file browser functionality is designed differently. That said, display issues, especially with Aero, can drive you to bang your head against the wall. So what follows is a series of complaints you may have with graphics and your display in Vista, and my simple (and sometimes quick) solutions that will help you fix them with confidence.